It has been too long since my last student game profile on Tethered, the cooperative maze game that explored issues of domestic abuse. Equality Street was a project that emerged out of students’ prior research in other classes. During the seminar portion of Gaming the System, we spent time in class discussing some basic social justice concepts, but as I mentioned in my course reflections, I had hoped that individual research and instructor consultations with student groups would help to develop their ideas for executing them in the game. In this case, students had engaged theories of colorblindness ideology in other classes here at UCSB and wanted to use that as the basis for their game design. 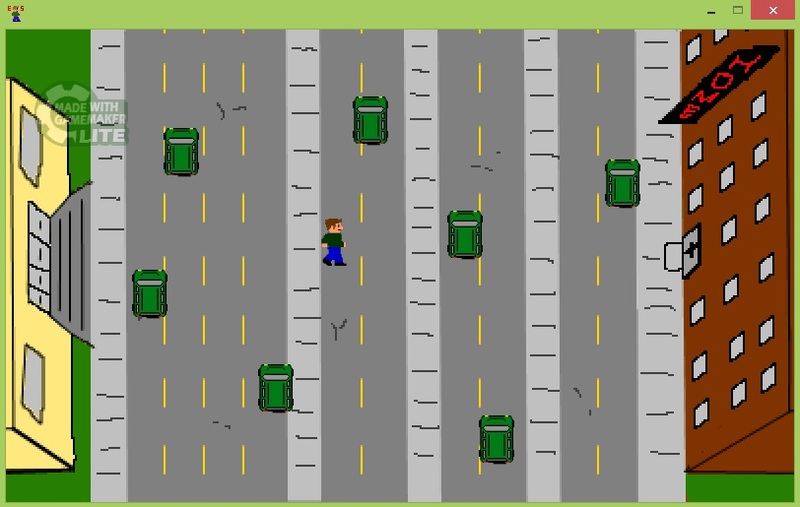 The result is Equality Street, a Frogger-type game that tasks the gamer with crossing the street to get back to the dorm after a night out. The game has four levels, each starring a different roommate: one white male, one white female, one nonwhite male, and one nonwhite female. 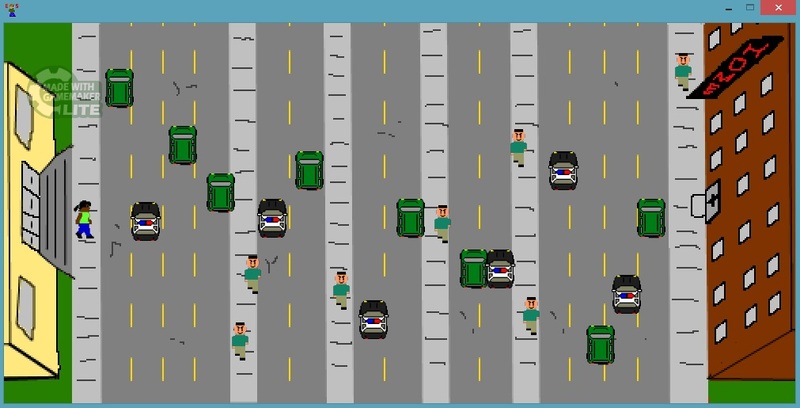 Each avatar has not only a different difficulty level, but faces different obstacles in the journey home: for example, women dodge stalkers on the street, and nonwhite characters must contend with patrolling police who will arrest them for jaywalking – a charge, the students noted, that is particularly absurd. As a conceptual demo, Equality Street succeeds in its primary goal: to suggest that race and gender have a nontrivial impact on day-to-day activities like walking home from a night out, despite popular discourse about our postracial society in the era of Obama. This group struggled with how humor and minimalization would dilute their message, and their writing and discussion of their project indicated to me that they had a more nuanced understanding of both colorblindness and intersectionality than Equality Street might otherwise suggest. This was a problem that came up in multiple groups: how do they balance fun and playability with communicating social and theoretical phenomena that are impossibly complex even to talk about. Their design decisions came not only from technological and time constraints (which were considerable given student experience with these programs and the demands of the quarter system), but also from a desire not to reduce identities and problems to caricature. For example, they declined to include a queer character in the game because of the difficulty in creating a visually queer avatar in pixelated style without resorting to high heels and feather boas. Another design compromise resulted in the apparently additive formula used to express intersectionality. Watching these compromises in action made me a bit more sympathetic to game designers who make similar omissions or shortcuts within their games and then explain that they don’t want to do it all if they can’t do it right. There are obvious differences here, however. These students, for one, are beginning from a position of inclusive game design and extensive research into social problems where developers generally are not. As I’ve already pointed out, the students are also on much more extreme budgets in terms of time, money, and experience. They are also making decisions with the knowledge that their grade is based more on their ability to reflect their concept than on whether the game is fun, which is decidedly not a game designer’s concern. Their choice to end the game on the white male level reverses the game design convention of increasing difficulty as a game progresses, while simultaneously invoking John Scalzi’s 2012 blog post, “Straight White Male: The Lowest Difficulty Setting There Is.” The stark contrast between the busy streets facing the woman of color and the empty ones in front of the white male combines with the surprise of having such an easy level to finish the game and draws attention to the larger point the group is trying to make about how identity impacts the way a person can move through the world. While Equality Street is a good example of some of the tough compromises students had to make in designing their games, its ultimate success as a product designed from the ground up by English majors is no less impressive.